The only running water in southern Arizona! Thus, it was really refreshing to visit the Patagonia-Sonoita Creek Preserve of the Nature Conservancy, about 60 miles from Tucson. Sonoita Creek flows year around, and although this was an unusually dry year (Tucson had only 5.67" of rain for the whole year! ), this creek just keeps flowing (see the photo). There is some interesting hydrology going on here! 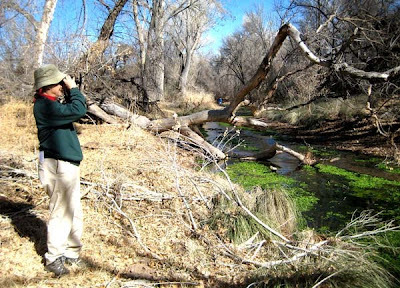 Understandably enough, Sonoita Creek has some interesting ecology. It is one of the rare habitats of the Gila topminnow (Poecilopsis occidentalis), an endangered species. It also provides the support for a rare streambank Fremont cottonwood forest. This is one of the few remaining sites in Arizona where this once-common forest type still persists. 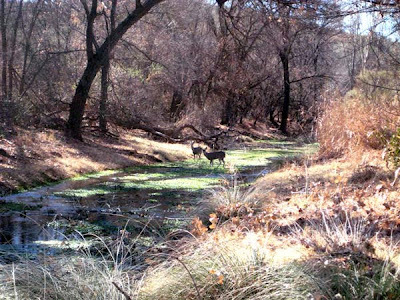 Arizona black walnut, velvet mesquite, velvet ash, netleaf hackberry, and various willows are found in slightly different habitats throughout the preserve. This vegetation itself provides support for an interesting avifauna. Among others, we greatly enjoyed watching the antics of the acorn woodpecker. In part of the Sonoita system are cienegas (marshes), where the rare Huachuca water umbel, Santa Cruz striped agave, and Santa Cruz beehive cactus thrive. The green vegetation in the creek bed in the photos is watercress, a nonnative but nevertheless pleasant to see in this otherwise dry environment. The frequent deer love to eat it! With Xmas behind, we are now exploring the oak savannas of the southwestern U.S. Yesterday we visited an area on the east side of Saguaro National Park. We approached the area through part of the Coronado National Forest, a huge region in southeastern Arizona east of Tucson. A sixteen mile drive in a four-wheel drive vehicle on a dirt road took us to Miller's Creek, one of the jumping off sites for the Arizona Trail, a grand hiking trail that runs the whole length (N/S) of Arizona. We started out in what is called Sonoran Desert (lots of saguaro cactuses), climbed gradually through desert grassland, and then reached the savanna at about 4000 feet altitude. The oaks were primarily Emory oak (Quercus emoryi), an evergreen species that has a characteristic open-grown form. There were also several other oak species growing as low shrubs. According to Ffoliott and Gottfried (Plant communities and associations of Arizona), other oak species found in this vegetation type are Arizona white, Mexican blue, gray, silverleaf, and occasionally netleaf and Toumey oaks. All of these are evergreen, and most of them lack the characteristic oak leaf shape that we know from the Midwest. The term "oak woodland" is more commonly used here than "oak savanna." They are sometimes called "encinal woodlands" from the Spanish word meaning "oak". Oak woodlands range from 4000 to 6500 feet in altitude (at higher altitudes are various types of pine/conifer forests). The climate is of course cooler than that of the desert, with more rainfall, and a lot of the rain comes in summer "monsoons". There is also occasional snow, and we found a few snow patches remaining from a heavy storm that had occurred earlier in the week. The flora, of course, is completely different from what we know from the Midwest. It will be a challenge to identify even the oaks, let alone all of the shrubs, grasses, and forbs. We are spending Xmas this year in Phoenix. Brian and Lea live at the extreme south end of the Phoenix area, just at the base of South Mountain Park, which claims to be the largest municipal park in the country. Yesterday we did a bit of hiking there. After so much time working on prairies and savannas, it was quite a shock to see thousands of acres of land with no ground vegetation at all. Only shrubs and a few scrawny trees, plus lots and lots of saguaro cactuses, which seem to thrive here. Other cacti that we saw were cholla, ocotilla, and barrel, all of which looked quite attractive when backlighted by the brilliant afternoon sun. There was also a lot of palo verde, a large shrub which has green stems that are themselves photosynthetic. Thus, even if all its leaves are dropped in a drought, this shrub is still able to make its own organic building blocks. After Christmas we will be taking off for southeastern Arizona, where I have my eye on some interesting oak savanna areas. More later. 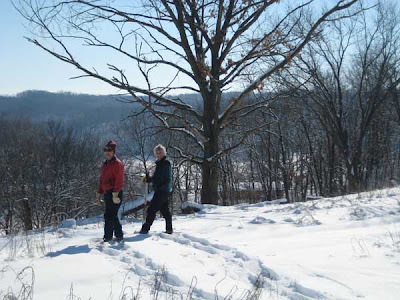 Jim and Marci Hess will be hosting a cross-country skiing/snowshoeing event at Pleasant Valley Conservancy on New Year's Day, from noon to 4 PM. The cabin will be open and warm, and there will be light refreshments. For further details, call the Hess's at 288-8662. There will be a hiatus in these posts while Kathie and I travel to Phoenix to have Christmas with our adult children. But we'll be doing a little "business" on this Phoenix trip as we intend to visit some interesting oak savanna areas in mountain ranges on the Arizona/New Mexico/Old Mexico border. This is an area called the "Sky Islands", where mountain ranges shoot up from very dry desert. As the tourist brochures say: "Lush mountain islands float above desert seas..." Mountain ranges such as the Chiricahuas, Dragoons, Pinalenos, Peloncillos, and Tumacacori's, represent about one-fourth of more than forty Sky Islands that make up the region. There has been considerable research in recent years on the use of prescribed fire to manage these savanna areas. Hopefully, we will be able to see some of the burn units. The species of oaks are completely different than what we have in the Midwest. The principal oak is gambel oak (Quercus gambelli), which is considered the "white oak" of the southwest. One of our major winter/spring projects is the construction of a boardwalk that will permit access across our wetland to the creek. The goal here is to have access to the wetland and creek, so that we can carry out restoration work on the wetland. At the same time, we will be able to monitor changes in the flora and fauna. The boardwalk is being constructed in units that will lie atop 5-foot sections of used utility poles (donated by Madison Gas and Electric). 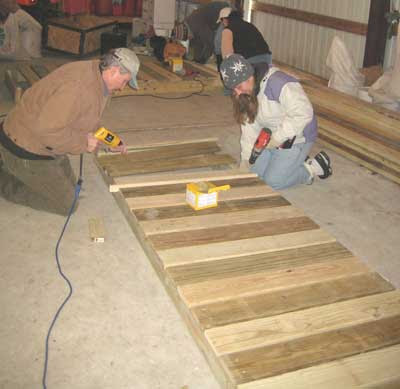 Each unit of pressure-treated wood is 10 feet long and the deck boards are 3 feet long X 6 inches wide. 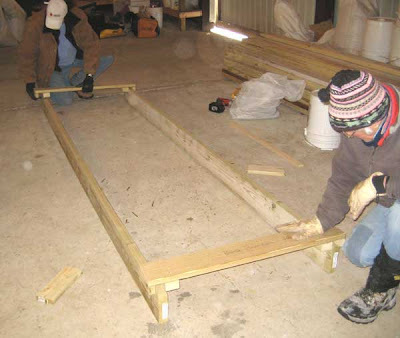 The design, created by Jim Hess, is simple and easy for non-skilled workers to construct. All 20 units needed for the complete boardwalk have been constructed in the past two days. The first photo shows the initial layout of a unit. The 10 foot long "stringers" standing on end are laid into spacer templates at both ends. These hold the stringers at the proper distance until the deck boards are attached. The second photo shows the early stage in the installation of the deck boards. A thin spacer board is placed between each deck board, and another spacer is used on each side to ensure that the unit remains straight and true during construction. Self-threading screws are used, which penetrate the screw holes and into the side grain of the stringers. As the deck boards are fastened, the unit begins to take shape. When about half the deck boards are fastened, the templates are removed. 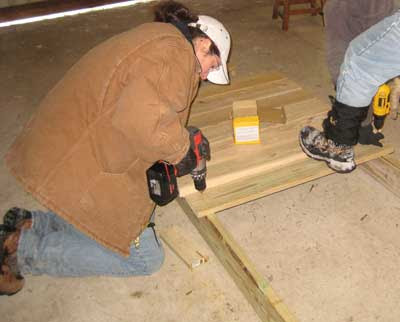 The third photo shows screw holes being drilled in the deck boards. These holes were found to be necessary to keep the deck boards from splitting. The next photo shows a unit almost completed. We found that a second unit could be built on top of the first unit, up to a stack of six units. A simple design involving alternating light- and dark-colored boards is being created. The final photos show several completed units, being stored outside in the snow. 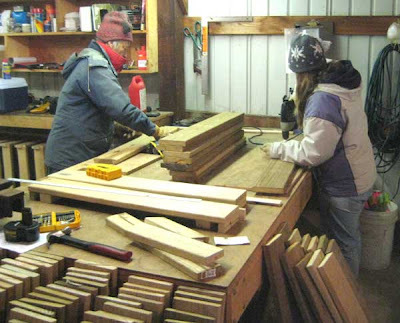 In addition to Susan, Marci, and Amanda (shown here), the construction crew included Jim Hess, Denny Connor, and Kathie and Tom Brock. 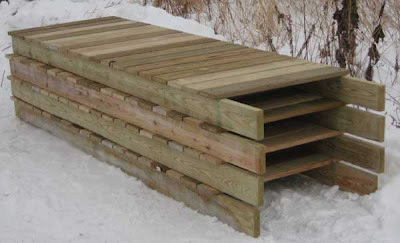 The boardwalk will be installed in the marsh as soon as conditions are suitable (absence of snow; hard surface). The units will be trucked to the starting point and laid end to end across the sedge meadow. Each unit will be fastened on each side to the next unit by two 2 foot connector pieces, using 1/2" bolts. The connection was designed so that the boardwalk units can shift, but the whole boardwalk will remain intact. Twenty units are needed to go from dry ground to the creek edge. A small bridge (already built) crosses a small, permanently flowing rivulet. 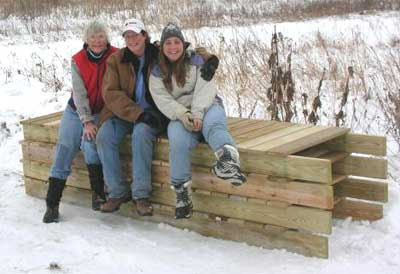 Installation of the boardwalk will require the help of a group of volunteers. Keep posted for further information. For the past decade the U.S. Forest Service has been sponsoring conferences on fire in eastern oak forests. The last conference was held in Carbondale, IL on 20-22 May 2008, and the proceedings are now available. Those interested in oak savanna restoration should find this publication interesting. It can be downloaded (PDF) or a print version can be obtained free by mail. The proceedings contains full-length text of 10 papers plus 12 abstracts of posters. Over 200 people attended. Although I have not attended any of these conferences, I have been following them carefully because there is so much new information coming out on fire in oak forests. Prescribed fire is now being used extensively in eastern oak forests, from New England to the Southern Appalachians and across the whole Midwest, all the way to Missouri and Arkansas. A lot of the recent activity has been brought about because the Forest Service and other agencies, as well as private landowners, have become aware of the great importance of fire as a management tool. Although in Wisconsin we tend to think of fire's role in oak savanna management, throughout the eastern U.S. it also plays a major role in management of many other kinds of oak forests. Posters deal with fire history, oak regeneration, effect of fire on maples, role of fire in forest management, and many other topics. The link below is to the web site of the Northern Research Station of the U.S. Forest Service , which is in Pennsylvania. They have lots of other publications available for download or for distribution in printed form. Among those I found especially interesting was a Photo guide for estimating risk to hardwood trees during prescribed burning operations in eastern oak forests which dealt not only with oaks, but with other tree species found in eastern oak forests. This nonprofit organization arose out of a conference held in Eau Claire in early March 2001. At the organizational meeting, I agreed to be the Treasurer and to act as the incorporator. We had many charter members who gave us checks at the meeting, thus giving us seed money that could be used to cover the initial work of getting the organization going. After returning to Madison, I took care of the incorporation paper work at the Wisconsin Department of Financial Institutions (incorporated March 8, 2001), set up the post office box, and established a business checking account at U.S. Bank. The initial board of directors put together the bylaws and budget and I prepared the application to the IRS for nonprofit status. Within a year we had over 100 members, and the organization has continued to grow since. IPAW was the brainchild of Kelly Kearns of the Wisconsin DNR, and those who played major roles in the early stages of IPAW (some are still active) were Dan Undersander (UW-Madison) President, Nancy Braker (TNC) Secretary, Rolf Utegaard (Eau Claire County) Vice President, and Jim Reinartz (UW-Milwaukee) Newsletter editor. The current president is Jerry Doll (retired weed specialist for UW-Extension), and treasurer is Tom Boos (Forestry Invasive Plants Coordinator for the DNR). Amy Staffen took over as Secretary when Nancy Braker left the state. Rolf and Jim still continue in their important roles. The current board has 13 members, well distributed across the state. In addition to my work as Treasurer, I did a lot of work on the web site, bringing in Martha Vomastic as webmaster and writing quite a bit of the early material. Martha continues to serve as webmaster and lots of people have contributed material. It is one of the most useful web sites for those interested in invasive plants of the Upper Midwest. Since its founding, IPAW has held almost yearly conferences, which have been well attended. The last one, in February of 2009, had over 300 attendees, many of whom had to brave a late winter snow storm to reach the site on the east side of Madison. For those involved in invasive plants (and what restoration ecologist isn't? ), membership in IPAW is strongly recommended. The newsletter itself is worth the price of membership. Among other items in the new issue are incisive articles on Japanese hops, Japanese hedge parsley, and wild chervil, three emerging problem weeds. Also, a concise research article on use of herbicides to manage garlic mustard. In addition to the important role IPAW is playing locally it also participates extensively in the Midwest Invasive Plant Network, which covers the states of Illinois, Indiana, Iowa, Michigan, Minnesota, Missouri, Ohio, and Wisconsin. Since our emerging weeds generally come from out of the state, associating with organizations from other states is very useful. The membership dues are nominal, and you can handle the whole process digitally (via PayPal) or download an application form and send in a check by mail. Big snow: out of work for a while! I'm not sure whether it is global warming or some wild gyration of the earth (butterfly effect, perhaps? ), but it does seem that our winters are getting snowier. We've had record snows the past two years, and now we have a third record year. I understand that last night/today's snow was a record for Madison. It was certainly heavy to shovel! The photo above was taken from my living room window. I'm not inclined to go to Pleasant Valley Conservancy until things "settle down" a bit. 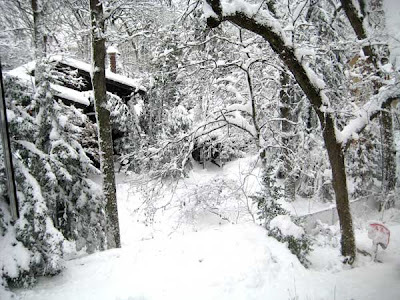 Hopefully, this heavy snow will not prune too many big trees, although we lost several branches here at home. A snow like this brings a certain finality to our buckthorn control work, since you can't basal bark with that much snow around the stems. In fact, unless we get a real warm spell, we may be out of business for quite a while. Too bad, because winter is a good time of year to deal with buckthorn. We generally use the term "restoration" to refer to what we are doing. Sometimes the noun is modified into "ecological restoration". Sometimes the word "reconstruction" is used instead of "restoration". The Minnesota DNR, which publishes a nice handbook on prairie restoration, makes this distinction: reconstruction refers to establishing native plants on a site that has been completely degraded, so that there are no prairie plants left. This site might have once been a prairie, but if so, it was a long time ago, and agriculture or forestry has destroyed it. Restoration, on the other hand, refers to starting with an existing remnant, a piece of land on which native plants still remain, although likely in a degraded condition. 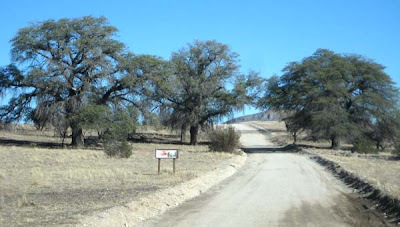 Restoration involves "improving" the native plant community, using techniques such as invasive plant removal, reintroduction of fire, and planting seeds or seedlings to supplement the existing species. The end results in both reconstruction and restoration might be the same, although in most cases it takes a lot less time to restore than to reconstruct. Although this distinction may seem a bit pedantic, since the goals are similar, the techniques are usually quite different. At Pleasant Valley Conservancy, we have done both reconstruction and restoration. Reconstruction: The four ag fields (Toby's, Pocket, Valley, and Ridge Prairies, now in the Conservation Reserve Program) had been in agriculture so long that there was nothing "good" left. The vegetation was principally smooth brome grass, with impressive amounts of invasive weeds including annual weeds, as well as such perennials or biennials as birds foot trefoil, ox-eye daisy, Queen Anne's lace, sweet clover, and wild parsnip. Two other "fields", the Crane Prairie and East Basin, had apparently never been plowed, but through the years had become heavily wooded. Again, the work was reconstruction, but starting with chain saws. In both cases, the final step before planting involved heavy applications of glyphosate herbicide to kill all existing plants. Restoration: On the other hand, the south-facing slope and all of the savanna areas at Pleasant Valley Conservancy were restored rather than reconstructed. Considerable chain saw work was required, to remove both invasive shrubs and trees. However, many "good" native plants were present and not only thrived, but increased greatly after the woody invaders were removed. Since years of degradation had led to an impoverished native flora, many new species were introduced by hand planting, a technique called "interseeding". One nice thing about the restoration work is that many surprises took place. Species that we did not know were present arose after clearing and burning, some of them quite rare. On the other hand, no surpise species occurred in the reconstructed prairies. What we planted was what we got, and nothing else. The best manual on restoration techniques is "The Tallgrass Restoration Handbook" by Stephen Packard and Cornelia Mutel, published in 1997 by the Island Press, Washington, D.C.
Today four of us used the basal bark technique with Garlon 4 in Bark Oil to treat mostly small buckthorn stems, as well as brambles, an occasional honeysuckle, and some other woodies. We started out using handspray bottles, but decided after an hour that this was too slow. We then loaded up four backpack sprayers and used those for the rest of the day. They worked quite well, although not all herbicide remained on the stems. However, since we were in a savanna area where there was a good leaf fall, the herbicide that did not get on the stems simply wetted oak leaves and should burn up during our spring burns. An important matter was to choose the correct spray tip for the backpack. The one we used was adjustable, and by cranking it fairly tight, a well defined spray pattern was created. Also, we found that if the pressure was kept high, the spray pattern was better. Strange little quirks, but important to attend to. The herbicide can be controlled much better with the hand spray bottle, but the work is a lot more slow-going. Since the labor cost is considerably greater than the herbicide cost, it makes sense to use the fastest method available. We'll continue to refine our techniques as time passes. It is hard to believe that I have been doing this sort of thing for over 10 years and still keep learning better ways to do things. The basal bark technique can be contrasted with the "cut and treat" technique. No cutting is involved with basal bark, and the treated shoots die in place. Since they don't leaf out the following spring, they don't shade the native plants, which are actually released by the lack of competition. With cut and treat, the woody plants are cut with a loppers, brush cutter, or chain saw, and the cut stems treated with herbicide. With this method you have the cut material to deal with. If it is small, it can be allowed to lie where it is cut, but large stems must be stacked and burned only after they are well cured. The choice of method depends upon the nature of the infestation. In our early days of restoration, we used basal bark a lot, even for large buckthorns and honeysuckles. The roots of the dead plants rotted away in a year or two and the plant just fell over. However, if you are clearing trees from a site, then it makes sense to cut the woody shrubs at the same time, and use them at the base of burn piles. In sum, there is no single "right" way to do this sort of work. Pick the most efficient for the conditions and site.